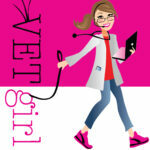 With an ever growing library of fluid types that veterinarians have access to, it is easy to overlook basic fluid types we have used for years, notably blood products. Plasma products are a mainstay of therapy for the critically ill and often coagulopathic patient. For patients that require coagulation support, veterinarians have access to several common transfusion products including fresh frozen plasma, frozen plasma, and fresh whole blood. 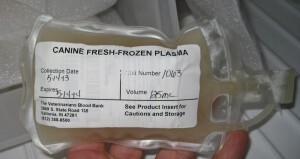 Plasma that is harvested from a unit of fresh while blood and frozen at -18°C or below within 8 hours from the time of initial collection is termed, Fresh Frozen Plasma (FFP). When it is frozen at -30C, the clotting factors maintain activity for 1 year. FFP can be used to treat coagulation factor deficiencies found in disease states including liver disease, anticoagulant rodenticide toxicity, liver disease, and hereditary coagulopathies. If the plasma is not harvested within 8 hours, or if FFP is not used within 12 months, it is labeled frozen plasma (FP) and is viable when stored properly for 5 years. FP is similar to FFP with certain coagulation factors and albumin, but does not contain the more labile coagulation factors V and VIII. FFP and FP are administered at a dose of 10-15 mL/kg. Fresh whole blood also contains clotting factors (as well as red blood cells and platelets) and is administered at a dose of 20-25 mL/kg. While plasma products are commonly used in patients with a coagulopathy, it does not significantly increase the patient's colloid osmotic pressure nor is it an economic use of resources for hypoalbuminemia. To raise the albumin level in the body 0.5-1g/dL, 40ml/kg of plasma (Fresh / Frozen Plasma) must be administered which can put a strain on valuable resources as well as being quite expensive. So do you use a blood filter when giving fresh frozen plasma or a regular line? Yes, there is the small possibility of clots and RBCs, so we do use a filter for all transfusion products.